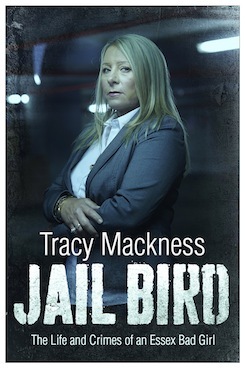 Tracy Mackness is an Essex bad girl turned good. 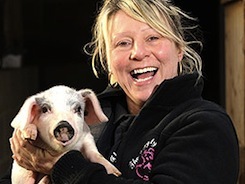 She is now the owner of the successful “farm to fork” Giggly Pig Company, with its distinctive pink and black vans, and its slogan “No fat or crap in our sausages!”. She is passionate about pigs, farming, and the challenges of running a small business. But underneath the warm twinkle in her eye is that hint of menace that makes it easy to imagine her in one of her many previous bad girl guises - teenage tearaway, gypsy wife, gangster’s moll, model prisoner. Tracy was inspired to turn her life around whilst in prison, when she met a Saddleback pig named Biddy and fell in love with her. She now lives on her farm in Romford, with her partner Barry, their four Jack Russell terriers, and several hundred pigs. Tracy’s story has attracted attention from a range of media. Tracy was the Gold Winner of the 2007 Barclays Trading Places Award - an award scheme designed to recognise individuals who have overcome extreme difficulty and changed their lives through setting up their own business.